Smoothfoam, a US manufacturing company, is family owned and was the first to introduce their dense, craft foam products to the craft industry. Its smooth, foam surface is ideal for a wide variety of crafts, home décor and mixed media projects. You can paint it without prepping, pin it, sand it, rubber stamp on it, cut it and a whole lot more. 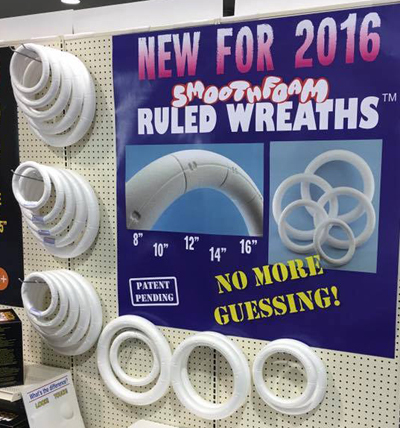 Earlier this year at the trade show in Anaheim, Smoothfoam introduced their "Ruled Wreaths" to the Craft and Hobby industry. Available in 5 sizes, 8", 10", 12", 14" and 16", the surface of these wreaths has markings, dividing the ring into 12 equal sections. This makes them SO easy for designers to work with - no measuring required! Imagine what you could do! Each of the following designers received ruled wreaths. See where their creativity led them then check back and let us know in the comments section HERE which project inspired you to be creative and how you would use a ruled wreath! A winner will be selected at random to receive their own set of "Ruled Wreaths"... Don't forget to check back here on June 1st to see if it was you! Make It for Mother's Day!